President Robert Mugabe arrives on May 6, 2010 to the World Economic Forum on Africa. Opposition political group calls arrests "an abuse"
(CNN) -- Police in Zimbabwe have arrested dozens of political activists and trade union members for allegedly plotting an Egyptian-style uprising in the southern African country. "We are not sure under what law they have been arrested and what they will be charged with," Rose Hanzi of Lawyers for Human Rights told CNN from the Harare central police station, where the group is being held. The activists who were arrested Saturday were allegedly caught watching video footage of protests that led to the ouster of presidents Zine El Abidine Ben Ali of Tunisia and Hosni Mubarak of Egypt. 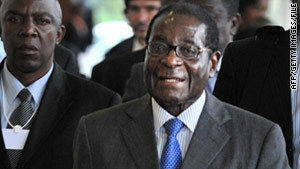 Zimbabwean President Robert Mugabe, 87, is not unlike the leaders who have recently been toppled. He has ruled Zimbabwe since independence in 1980 and has been accused of rigging elections and instituting repressive laws to tighten his grip on power. The arrests may be an indication authorities are worried the winds of change sweeping across north Africa may inspire Zimbabweans to rise up. The opposition Movement for Democratic Change, MDC, which is in a troubled unity government with Mugabe's ZANU-PF, has called the arrests "an abuse of state machinery by ZANU-PF to suppress the people's views." Mugabe's failed policies over the past 10 years have been blamed for plunging the once prosperous country into an unprecedented economic crisis. Mugabe has called for an election this year but his political rival and leader of the MDC, Morgan Tsvangirai, has threatened to boycott the poll if a referendum on a new constitution is not held.